I love chocolates, I am sure Everyone loves chocolate. Chocolate is become one of the most popular food in the world. Did you know, we can make chocolate at our home with just only 5 ingredients. Yes, you are reading right I'm talking about Chocolate ! Today I discovered a new creativity that how to make Chocolate at Home. Now-a-days chocolate are in high demand with fans around the world. Homemade chocolate is any easy recipe and a great snack for everyone. Milk powder : 15 tbsp. Chocolate / cocoa powder : 7 tbsp. Butter(salt less) : 200 gm. 1. Melt the butter and keep aside. 2. Nicely mix chocolate powder and milk powder and keep it aside. 3. Melt sugar in 1/2 cup water. 4. On a low flame, add the mix of chocolate and milk powder to the melted sugar and stir continuously. 5. When the mix comes out almost in the form of paste, remove from flame. 6. Add the melted butter and stir nicely for 5-10 minutes. 7. Grease a tray/steal plate with butter and pour the mix into the tray and keep in the refrigerator. 8. Allow it to cool and Cut it into pieces/shapes. 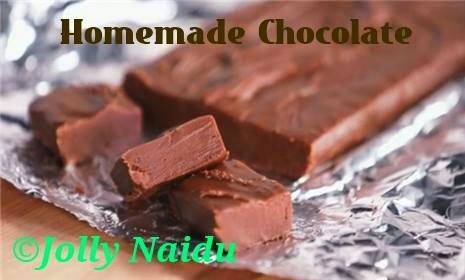 Easy and tasty homemade chocolates!! Which cocoa powder is to be used? Can we use wikifeild drinking chocolate instead? Shivam you can use any coco powder which is easily available at your near by place. I am using "Natural" and "Eagle" brand of coco powder in my cooking...don't use drinking chocolate it will not give you good texture of chocolate !! Love the recipe. Very excited to try it! !